For a recreational SCUBA diver, the blue hole in Belize is one of the deepest dives available. 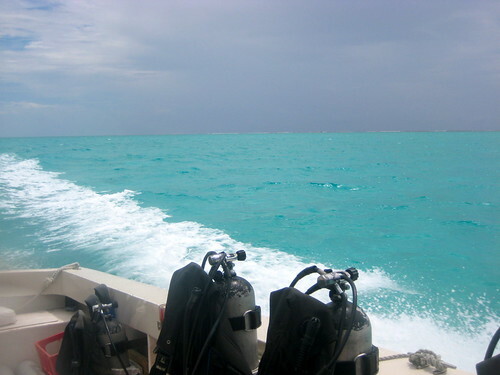 The water is clear, warm enough to avoid a wet suit, and is packed with colorful fish and rather harmless reef sharks. The blue hole is a sinkhole in the middle of the ocean that filled in with water after the last ice age. It is over 400 feet deep (though you won’t go much farther than 130 feet) and draws visitors in with its massive stalactites that are as old as 153,000 years. Most blue hole dives in Belize include two additional coral wall dives in the Lighthouse Atoll that are almost more spectacular than the blue hole itself. 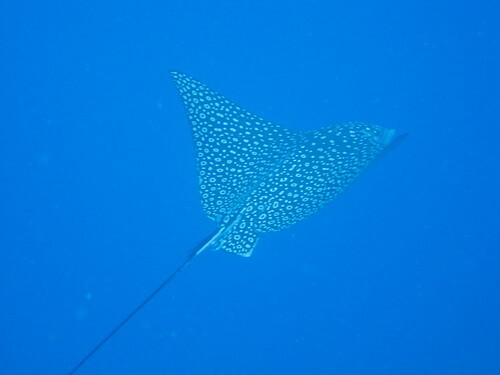 This is consistently rated one of the top dives in the world. So, you want to dive the blue hole, but you’re not sure how to go about it? Chances are you’ll be departing for the dive from one of the cayes (islands accessed by river taxi or prop plane, usually from Belize City). Caye Caulker is my absolute favorite, but it is a smaller island and diving service options are a bit more limited. Most diving boats take off from Ambergris Caye, and will often stop by Caye Caulker to pick up more divers if they need to fill more slots. Boats take off very early in the AM as it takes about two hours by boat to get to the blue hole. If you plan to spend a few days in the cayes, and I can’t fathom a reason why you shouldn’t, make plans for your blue hole dive from day one. Belize is laid back and specific planning simply doesn’t happen here. Boats don’t take off unless they are fully booked, meaning you might think you have a trip planned that could end up cancelled. If you want to make sure you get to do this dive, give yourself a few days in the cayes, and make it a priority from day one. Some tour companies want divers to have a certain number of dives on their log books before they’re willing to take them to the blue hole. Since the blue hole was only my third dive, I could not choose one of these companies. Some companies make the trip as comfortable as possible, offering chocolates, top-rate equipment, and a hefty price tag to go along with it. Other companies are cheaper, but may have less fancy equipment and may serve fruit instead of chocolate. Both tours will end up exploring the same places. Ask yourself if the extra $200 for the luxury tour is worth it. You are a trained diver, and you know how to check your gear, and you probably do for each dive you take. Be just as careful with the blue hole dive. I noticed two leaks in my gear before I hopped in the water, and got new gear on in time to avoid any problems. Make sure you have a diving partner. The blue hole is not a scary dive. It’s honestly one of the coolest things I’ve done in my lifetime. However, you could possibly suffer from nitrogen narcosis (a ‘high’ feeling marked with confusion) due to the extreme depths. Make sure your partner is always nearby and make sure you have the narc signal understood before you dive so that you can watch out for each other. 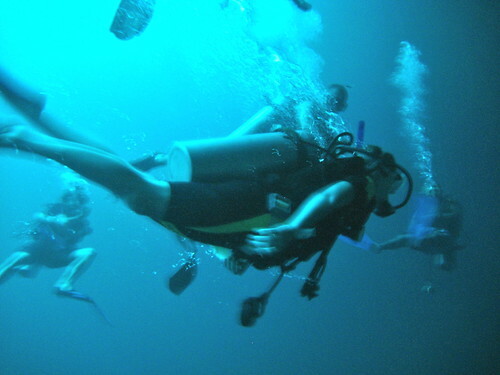 Ascending a bit should help if nitrogen narcosis does hit. I will say this, out of about 15 divers, only one got narced on my trip. She was completely fine to complete the rest of the dives and suffered no damage. If you are worried about the depth of the blue hole, fret not, Belize has the second largest barrier reef in the world, second to Australia, and offers many other exciting dives. If someone in your group is not a diver, the snorkeling is excellent as well. Wow, what a fascinating place to dive in! 😀 The colour of the water looks unreal! We didn’t even need wet suits! We learned to dive with Frenchie’s Dive shop out of Caye Caulker – great place to dive, even better place to learn to dive. Wow, looks absolutely amazing. It’s going on the bucket list!